Welcome Parents, Grandparents, Teachers, and everyone in between. ‘Tis the season for vegetable gardens to burst forth with delicious bounty, while we battle voracious bugs and vicious weeds! So here is a rhyming story for kids – all about the joys and agonies of summer gardening. And there’s some real cool facts at the end of the story too. but you can keep your garden-food. when you can buy stuff at the store. and kept my feelings to myself. We found a sunny garden spot. I worked till I was sweaty hot. We turned the soil to make a bed. “Now add manure,” my father said. He laughed and handed me the rake. it didn’t even stink a bit. We put in rows and rows of seeds. and wrapped some wire all around. I moaned and groaned till we were done. My dad said, “Next comes all the fun. and wiped my hands across my shirt. Now what’s a grumpy-dude to do? I didn’t have a garden-clue! For weeks I battled wicked weeds. I shrieked at slugs and centipedes. The sprinkler hose had sprung a leak. My garden-life was looking bleak. Then day by day, the changes came. And things no longer looked the same. Who knew that peas could climb a pole? Or squash would grow out of control? We built a trellis with some twine. I helped my dad with the design. picked carrots, beets and lettuce greens. Our yard looked like a grocery mart. I could have used a shopping cart. and suddenly, I had a thought. “It’s pizza night,” I told my dad. I showed him all the stuff I had. Red peppers, onions, herbs and more. We made the dough – it was a breeze. I cooked the sauce and added cheese. I gave the first slice to my dad. It was the best he ever had! is really into growing food. I grew a cuke – big as a log! I grew a gourd – shaped like a hog! But all I got was dirt and dust. to grow a pepperoni tree? Many gardeners say that radishes are the fastest growing vegetable. Most veggies grow in about forty-five days. But radishes can go from seed to your lunch box in under one month. Most radishes are crunchy and hot. Radish juice is supposed to be good for sore throats and colds. So the next time you have the sniffles, try squeezing a radish. 2. The eyes have it. The only way to grow a potato is to plant a potato. You need a potato with “eyes” on the skin. These eyes are potato buds, and they grow new potatoes when you plant them. Just cut a potato into four pieces. Then put the pieces in the ground with the eyes pointing up. You’ll soon be digging up – one potato, two potato, three potato, four…and maybe more. 3. The lady and the toad. There are lots of bugs and critters lining up to chomp away on your garden goodies. But not all of them want to eat your vegetables. Ladybugs and toads actually help your garden. They eat the pesky bugs that like to feast on your veggie plants. So give these two friendly helpers a big lunchtime welcome. 4. Grub in a tub. If you haven’t got a spot for a garden plot, use a pot. Almost anything can be used as a container. Look around for cans, boots, barrels and maybe even an old bathtub. You’ll need an adult to help you fill the containers with soil and get them ready for planting. Cherry tomatoes, strawberries and peas would make delicious snacks-in-a-pot, don’t you think? 5. More food for thought. Garden-lore has it that an herb called basil will keep witches away – even on Halloween. And did you know that both vampires and mosquitoes don’t like garlic? Come to think of it…vampires and mosquitoes have a lot in common, don’t they? So remember: Eat garlic tonight, the stinky delight. And smell as you might, you won’t get a bite! Grumpy Garden Dude is just one of the six rhyming stories in Monster Lunch. 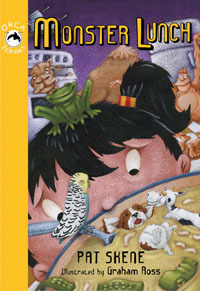 Each story poem is followed by a list of cool facts for kids. Thanks for reading, simply for the fun of it! I’ll see you between the lines.